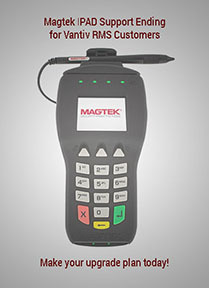 May 24, 2017 – RMS customers with Vantiv merchant services using the Magtek IPAD pin pad devices will want to take action as soon as possible to explore upgrade options for your solution. As of May 31st, 2017, Vantiv is discontinuing support for and sale of Magtek IPAD devices for Microsoft RMS users. Not to worry, however, Vantiv has options. You can upgrade your Vantiv devices to either the Ingenico ISC250 or the Verifone VX805 device with the Vantiv VIPay integration for Microsoft RMS. Both the ISC250 and the VX805 are EMV ready, increasing security for your payments environment. We recommend you reach out to your Microsoft Partner or Vantiv merchant services representative today to discuss your options for an upgrade before support for the Magtek IPAD ends.